Website price $34.95 with FREE SHIPPING! SAVE MONEY! 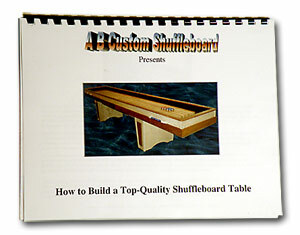 - BUILD YOUR OWN SHUFFLEBOARD! These step-by-step plans are easy to follow and include many pictures and illustrations. You can build a 12', 14’, 16’ or longer table! 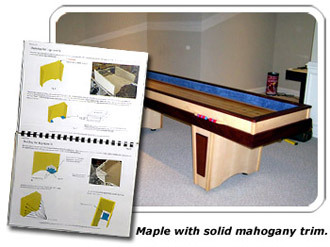 The plans contain 22 pages of information, illustrations and photographs that take you from start to finish in building your own shuffleboard table. Printed in color on 8 1/2“ x 11“ premium paper, the plans are bound in a durable spiral binder that you can use as a handy reference in your workshop. The plans also include a complete materials list with dimensions for each part. Check out some of the sample plan book pages along with completed projects below. These shuffleboard builders used their creativity to give their tables an individual, custom look. 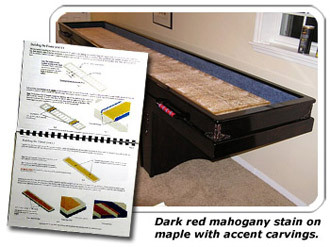 Some of the necessary shuffleboard components such as an abacus and climatic adjusters can be purchased in our store. This is a very rewarding project that will provide many years of enjoyment for your family and friends! SAMPLE SHUFFLEBOARD TABLES MADE WITH OUR PLANS! 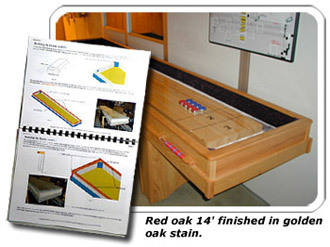 See More Table Shuffleboards Built by Our Customers with Our Plans! Q. How many hours does it take to build a table? A. The time to build a table can vary greatly depending on the skill level of the builder and tools that they have. The following times are intended to give a rough estimate for average skill level and a typical shop. Q. How much will the table materials cost? A. The following is a materials cost estimate. A large part of the cost difference is whether you build the maple playing surface or have someone make it for you. Q. What tools are needed to build a table? Table saw, Miter saw, Random orbital sander, Surface Planer (this somewhat depends on whether you make the playing surface or have someone make it. It also depends on the condition of the wood used to build the frame). Drill / Driver and bits, Router, Biscuit jointer, Various size clamps, Saw horses, Jig saw (band saw is also helpful), Tape measure, carpenters square, long straight edge, etc. Q. What size table can be made from the plans? A. The plans are primarily geared toward making a 14' table (mostly the images). However, the plans do have various charts within the bill of materials that allow for shorter or longer tables. Longer tables do require some changes that are discussed in the plans, but not necessarily detailed out. For example, to build a 16' table the primary change is adding a center leg. Tables that are 18' and longer are to be built as a two piece frame. Q. Do the plans address climate adjusters? A. For those that may not know... climate adjusters are metal devices that get bolted to the underside of the playing surface in order to compensate for table warping. Tables can warp slightly due to changing temperature and humidity conditions. Installing climate adjusters allows for the control of table warping. (almost like braces on teeth). Although the plans do not include climate adjuster instructions, they do allow for adjusters to be installed through slots that get cut into the table bed. Climate adjusters can be purchased from our store. 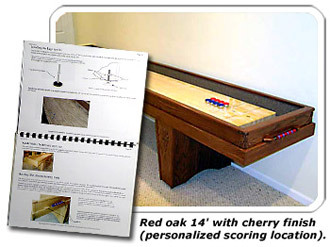 Want to build a Bumper Shuffleboard Table?